topiary plants live a lifetime if you learn to take care of them properly from the beginning. Our beautiful, green live ivy topiaries are the freshest and heartiest you’ll find. We take great pride in shaping them into whimsical shapes – such as this adorable birdcage ivy topiary – and shipping them to you with the greatest care. You’ll find our topiaries not only gorgeous and healthy but equipped to adjust to your home – whether you live in Alaska or Florida! Our live birdcage topiaries are shaped with the delicate vines of the ivy plant. They will flower with tiny leaves to fill out the frame of the birdcage design. The topiary is outfitted with a handsome terra cotta pot, and the base is filled with more flowering, green ivy. 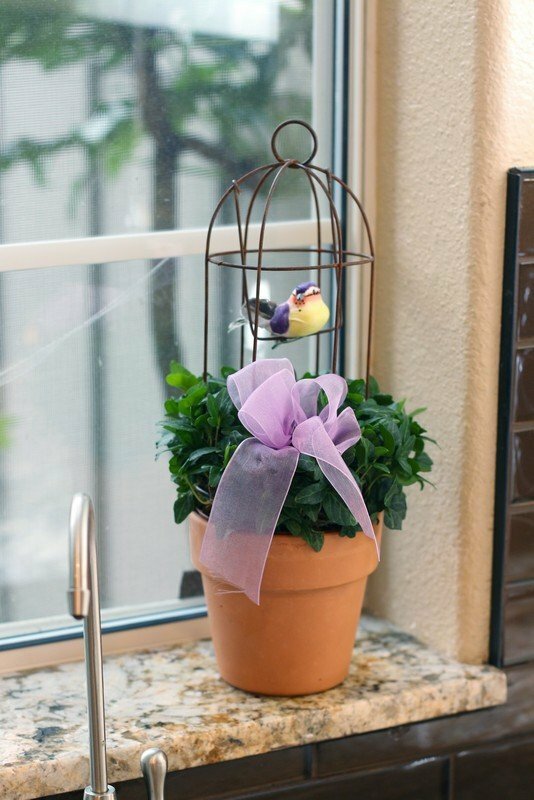 You can add decoration to your birdcage ivy topiary – most whimsically with a small bird in the cage. But there are no limits to the kinds of decorating you can do with this unique plant. Fill it with freshly dyed eggs during springtime or Easter. Fill out the base with fresh daises or roses. Stack fruits such as lemons and oranges inside the birdcage for a beautiful, fresh table display. Our birdcage topiaries make not only great decorations for your home or special event, but they also are perfect for special occasions. Present your mother with one for Mother’s Day. Bring a birdcage topiary to your grandmother in a nursing home. Send one to your child’s favorite teacher as a year-end gift. With so much durability and versatility, a gift recipient will have no trouble maintaining one of our lush, beautiful live topiaries. Order yours today! BIRDCAGE Ivy Topiary. Let soil approach dryness between watering. Do not let roots sit in water. Exposure: Bright, indirect light. Indoor Temp: 40 - 80 degrees F, Weight: 2 lb, Pot Size: 4.25 inches, Height: 14 inches.